How much hooch will I have to down before I get to the Wonderland? WHAT WHERE AM I NOW? Elsewhere John is wandering alone in the maze. I wonder if I’ve changed somehow? BUT IF I’M NOT WHO AM I NOW? I can’t be the same. I’m actually singing. I don’t do that, do I? The above is an excerpt from the musical Speakeasy – the Adventures of John and Jane Allison in the Wonderland, a Roaring Twenties adaptation of Lewis Carroll’s Alice books featuring two Alices, the newlyweds John and Jane Allison. Jane has just “gone through the rabbit hole” at the same time John has slipped “through the looking glass”, and they find themselves in a magical dream world where time and space and identity don’t follow regular rules (to read more about Speakeasy, you can access additional posts about the musical by selecting “the Speakeasy Chronicles” in the category sidebar). In addition to the mind bending shifts of time and space as well as the shifting understanding of who they are that John and Jane experience while in the Wonderland dream, they also experience the actuality of music accompanying their activities and the seeming normalness of they themselves and the people they meet easily breaking into accompanied song. Which of course is rather convenient for the drama, as Speakeasy is a musical. During the excerpt above, John and Jane, in separate areas of the magical world they slipped into, for the first time experience themselves unexpectedly warbling snatches of song, and remark upon it. Jane finds this amusing, but John is a little more alarmed. Is it really necessary to justify characters breaking into song this way? No. Speakeasy is a musical. And if there is a single most salient element of musical theater it is that characters break into song. On the other hand, at least ever since the movie version of Cabaret filmed every musical number realistically, i.e. as a naturally occurring performance (see previous blog post), it behooves creators of musicals to at the very least consider the “rules” of musical performance in any particular musical and how traditionally and/or uniquely they wish to apply them. 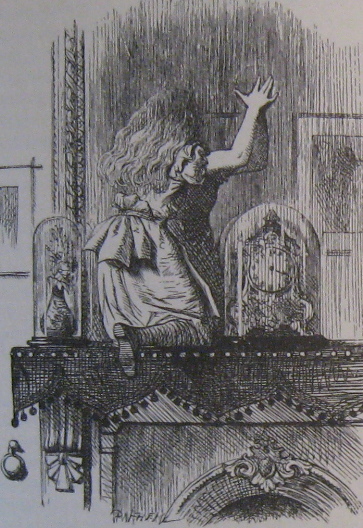 When I imagined the protagonists of Speakeasy going “down the rabbit hole” and “through the looking glass” into a magical dream world, I wanted the effect to be as dramatic as The Wizard of Oz switching from black and white to color when Dorothy steps out of the farm house into Munchkinland. 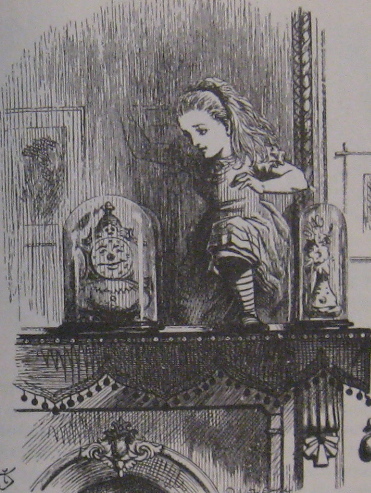 Why not include the act of characters breaking into musical numbers as yet another strange feature of the Wonderland fantasy, as much as the odd shifts of time and place and identity are? Once the first couple of references to this strange new behavioral oddity are made (as described in the first paragraphs of this post) the story of Speakeasy can happily rattle on as a full on musical with singing and dancing as much an unremarked upon part of “reality” as everything else strange and marvelous in Wonderland. At least until the Allisons wake up from this dream in the end. Which doesn’t mean however that the beginning of act one (after an opening number set in the Wonderland) is completely without songs. I just took some inspiration from Cabaret and made sure each number in the “real world” was performed as songs would be performed in the real world. Jane may put a record on the phonograph or her neighbor Roberta may turn on the radio. A song (that just happens to reflect upon the action in John and Jane’s apartment) plays, and the audience is allowed a glimpse of the singer performing said song in the radio or recording studio. No character is “breaking into song” unnaturally. We hear and see a song performed by a professional singer in front of a microphone. The same rule applies at the end of act two, when John and Jane wake up from their strange mutual dream. They find themselves back in their apartment, unsure about what has happened to them, unsure even if it was a shared experience their spouse is aware of or just a dream they dreamed alone. But when the radio is turned on, they hear Chet Cheshire, the master of ceremonies of the Wonderland nightclub singing a very particular song, a song they remember from their dream. It gives them the courage to sing out loud themselves for the first time in the real world, and to share the truths they have learned about themselves in the Wonderland, to “speak easy” about themselves to one another for the first time. PS: To hear more Speakeasy demo recordings, go here. This entry was posted in Cinema Scope, The Speakeasy Chronicles and tagged Alice in Wonderland, Breaking into song, Cabaret, Dream, musical, Speakeasy, Through the Looking Glass, Wizard of OZ. Bookmark the permalink. Another well-considered justification for characters singing: the infamous episode of BUFFY THE VAMPIRE SLAYER called “Once More With Feeling.” Here the characters are magically compelled to express held-back feelings in song, usually to the characters to whom they least want to reveal their true feelings. It works because none of the actors are really singers, making the conceit seem “real.” And the revelation of these feelings moves along a number of character developments in an unexpected way. Gentle readers – and gentle blogger – worth taking a look, say I.